Google+ is gaining traction and, with the release of Search+, has become more relevant to businesses because Google+ company pages are now showing in search results. Setting up a page on this growing social network gives potential customers one more way to find your business. You might notice as you setup your business page on Google+ that you don't have to verify you're the business owner. Google Places requires telephone verification to ensure ownership of the business but this wasn't included in Google+. Why? Great question. I think we'd all like to know. This means that 'name squatting' is entirely possible on Google+ unless you're a global brand (and Google likes you). The only recourse at this time is to go ahead and create an 'official' presence for your business on Google+ by creating a company page. Google has made it easy to create a business page by giving us a wizard style tool. Even though there are a few screens, it's really just a two-step process asking for very basic information. Creating your business page on Google+ will only take you about 5 minutes. You'll need to decide if you'd like to be listed as a 'Local Business or Place' or as a company before you make your page. The only difference I discovered is that a 'Local Business or Place' links the page to a Google Place page and requires the business phone number. Creating a 'Company' page does not link a Google Place page and requires a website address for the business to get started. Now, just follow these two steps. 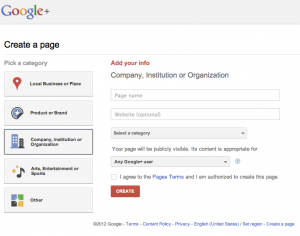 Claiming your brand or business page on Google+ requires a Google account. If you don't have one, you'll need to create a Google account. Visit http://plus.google.com/pages/create to make your page. Before you begin, you will need to decide if you'd like to be a 'Local Business or Place' or a 'Company, Institution or Organization'. When I elected our company to be a 'Local Business', our Google Place page turned up in the search results. I chose our Google Place page and it was linked to the new Google+ page (confused by the naming scheme yet?). If you don't have a Google Place page, you'll be prompted for the information to create one. Creating a page is quick and simple, no matter which choice you make, due the wizard style process. You'll add relevant information about your company like the company tagline, logo, etc. The process is straight-forward and self-explanatory. A lot of the information is optional. So, if you don't have a copy of your logo handy -- this can be done later. The last page of the setup process prompts you to promote the page. If you're electing to come back to this later, wait to promote the page. You can always do this later. Now, you can integrate it into your marketing mix as it makes sense. When you decide to integrate Google+ into your marketing, be sure to checkout options for integrating Google+ into your website & blog including the badges. Giving people the ability to share content via Google+ will create more visibility for your business. We haven't yet seen tools that let you automatically post to the page like other social networks. Google just recently released an API for Google+ so we're expecting to see post automation solutions soon. A couple of weeks after you make your page, you might find yourself wondering how to locate it in Google+ (like I did). In the left sidebar, you'll see a drop-down that lists your pages. When you click on the page name, posts are made from the page instead of you. 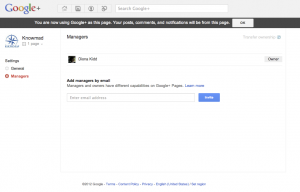 Google+ now supports multiple admins for pages. You can add other profile managers, if needed, using their email address. This is found under 'settings'. Of course, you can always back out of the whole deal and delete your page.